Carefully made in the UK by… That’s something you took for granted at one time, these days it means either valiant independent or old. In this case both apply, the former at the time of its manufacture in 1995 and the latter as I’m taking it’s photies. Old it may be, but amazingly this pack is new and unused. Indeed it was likely review kit that never got reviewed (I bought it unawares from a well-known freelance writer on ebay, which also means that the safe waiting time for selling test kit on ebay is around 15 years… ), and I am overjoyed to have put a ludicrously large bid on it to make it mine. This is the one area where the inner geek takes the controls without conscience or consequence. I know these packs have been a common sight on here, but never this shiny. So, once again: the classic Karrimor Alpiniste 45+10. It looks like i’ve just taken it off the rack in a shop, and the dilemma is, do I use it this winter? How cool that would be to use one again for “the first time”. The OMM Villain may well be my favourite pack, but this is my favourite pack of all time. I forgot how tight the elastic edge on the lid originally was, how rigid the webbing was when new. The colours are so bright as well, not just the purple, but the mini rainbows of the Elite logo and the cord and zip pulls. Some of the wacky features that disappeared can be seen above and below. The side-fastening buckle above was brilliant, out of the way and low profile and didn’t ice up. The ice axe holders below are usually missing, so they obviously had a more scattered fan base, but for short technical tools they work fine. I once spent half an hour stuck on a slope jammed between my pack and the snow with a 70cm axe being the rock upon which I was grounded as I could neither get it all the way out or back in. Well, it is the Alpiniste 45+10 not the Bimbler 45+10, so it serves me right. Below is the chest strap which had an elastic loop to give free movement and expansion, a feature still missing from a lot of packs. You can see the basic padding as well there, just a lumber pad, much like the Villain. It really is all you need on a pack this size. 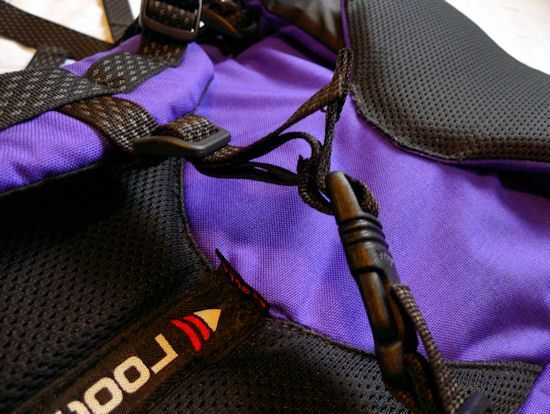 In ’95 the pack still had those little extra features that vanished over the next few years. The extra inner lid pocket and the internal snow shovel and handle/probe pockets, and of course those ice axe holders. This has brought me much joy in it’s glorious purply newness, and has also given me pause to think. I have er, a fewof these in various states of repair. I might take one of the most dogeared examples and sew some mesh/bottle pockets onto it in place of the wand pockets. Pretty pointless aye, but I wonder how many times I would lift it to use if the on-the-move-accessibility was better for my bits and pieces. Ach we’ll see, it’ll put on the to-do list. Maybe I’ll just pack this one with gear, attach my old Lowe Alpine insulated bottle pocket to the hip fin and pretend I’m still 27. 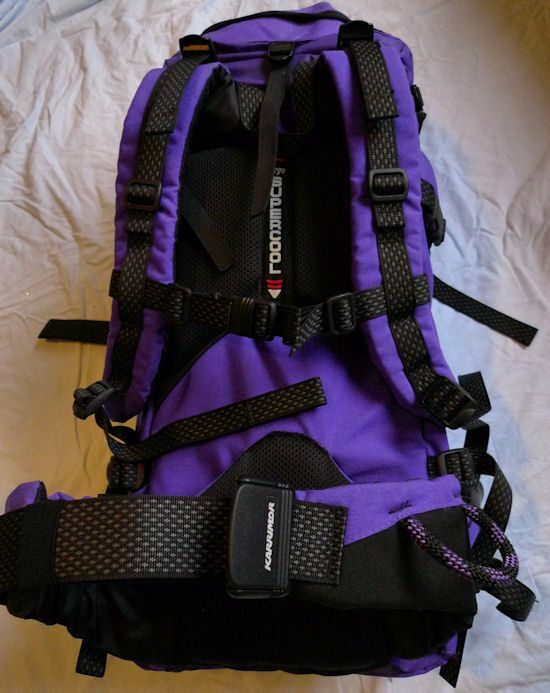 This entry was posted in Items Various, Kit Reviews and tagged gear, Joy, purple. Bookmark the permalink. Your bidding for duplicate old gear on ebay because its shiny and new……erm is it time for the men with the white coats to pay you a visit ?? Quite like the ice axe holder, never seen that before. I still have 2 old karrimor packs in my loft somewhere bought back in the 90’s too when they were a decent gear manufacturer. The one pack was a very simple 15litre job with one buckle, no hip belt and no pockets! Looks nice, I’ve just got an shiny orange 97 model and its brilliant, been after one for years. Definitely my favourite pack. Nice to know what the inner pockets were for. Looking forward to use it this winter. The axe holders look good, either missing or don’t come on the one I brought. The axe holders are neat, Grivel have made them (still do? )and I’ve seen either Cassin or CAMP in the past as well. I’ve never liked the axe down between the shoulder blades thing when you need you hands free, but it does keep the blade away from your soft midrift! Backpackbrewer, Karrimor were well ahead, they had lightweight models too far ahead of their time. There was a lightweight vesion of the Alpiniste which was around half the weight. Them was the days indeed. It’s almost enough to make you weep for the fate of Karrimor. Does anyone know when Karrimor stopped UK production? I had the same model but slightly earlier i think about 91/92’ish and i can’t remember exactly what i did with it. I think i gave it to a mate ages ago who i used to walk with. I live quite near to where the karrimor place was, great kit, staff & service.KSB 3 boots my all time favs. I just can’t ever see myself buying KARRIMOR kit off Mike Ashley (sportsdirect) though now, an entirely different entity. i swear that hipbelt is a car seat belt! reminds me of my Karrimor backpacker’s bag that i bought in the mid 90’s, that’s still unused. btw, dare i ask, how old might ye be, pete? 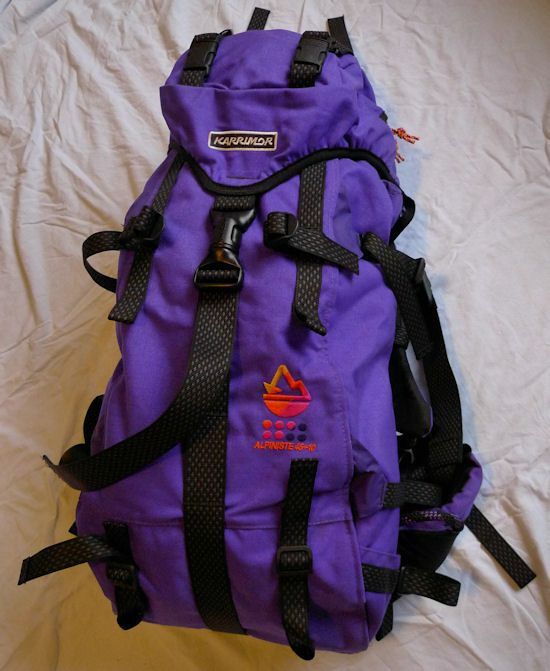 also, i wonder how the karrimor bags from it’s glory days compare to today’s gear? This all brings back memories (not so distant) of my Karrimor Hot Earth (’96 model, very red) that was in use most weekends for nearly 10 years. In fact, it got a wee spin on the Cuillin earlier this year on the basis that it is almost indestructible. A great pack – the fformat back system had good structure and non-absorbant mesh (nothing much better these days). 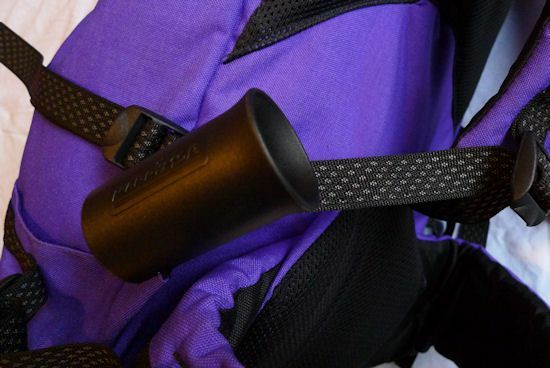 The hip belt is indeed like a seat belt, albeit rather ruggedised! After nearly 10 years of very regular use as my only pack, it has virtually no sign of wear (just a little splitting of fabric on shoulder straps) – doubt I’ll be saying that about my current packs. That purple is pure pimping!! Tghe fate of Karrimor will always be felt deeply by me, I used to be pretty much head-to toe in it. UK manufcature I’m sure had ceased completely by 1998. The new stuff is really just a branding excercie, but many of the familiar names are just the same, TNF, Berghaus, Mountain Equipment etc. It’s not aklways a bad thing, but Mike Ashley had totally destroyed the name with his shoddy treatmemt of the name and some of the crap kit it adorns. I will be 41 before the year is out, and the old gear stands up well in comfort, just not in accessible features like hip and bottle pockets. I have a ’95 or ’96 Hot earth, great pack! I’ll need to scan in some photies of that one, long hair and snow will also be visible I think! I bought an 2008 Alpiniste 45+10 a while back, £60 F&T sale. I reckon it’s a better pack than the early noughties Alpiniste which was overloaded with features and too damn heavy. The 08 model is over a kilo lighter at 1300g and lighter still if you remove the hipbelt. It doesn’t look as tough as the earlier version but it still makes my LIM45 (1100g) look like a carrier bag. It’s tall and narrow as you’d expect from a climbing sac, but the build quality is still there with bartacking in all the right places, still got the elasticated chest strap too. As an added bonus it’s ORANGE!! I don’t see the problem with current Karrimor rucksacks to be honest, spend the cash on the top end models and they seem to be as good as anything else, spend £15 on a Karrimor branded daysack or a festival tent and you’ll get junk but you’d expect that. 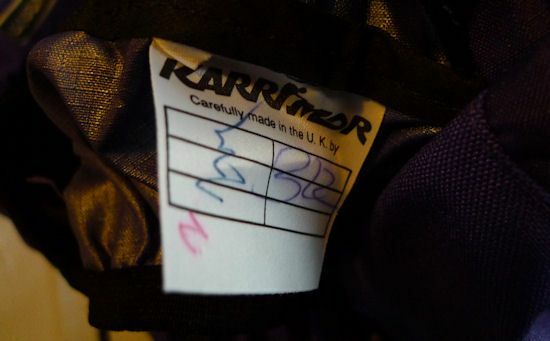 I think so many folk take it personally what happened to Karrimor, much more so that any other big UK brand, all of whom have been bought over and have only tenous conections to their past if any at all. Folks just haven’t forgiven Mike Ashley for killing Karrimor. Yet? The association of the name from the good packs with the cheap tat has really damaged the brand in the UK. I was looking at the X-Lite 35 the other day and it’s a decent pack, but there’s no bottle or hip-fin pockets and the harness is very stiff, but it has a great external stuff pocket on the front. There’s great features across the range, but the packs have daft mistakes on them too, straps across pockets for example. I think they look like they’ve had no pre-production testing and they’re being designed by someone in isolation, or with budget and time constraints. More input and care and the range would be killer. just spotted this article, worth having a look at some of the older (mid 2000’s) decathlon mountaineering rucksacks(if you can find them). Some similar brilliant features, my 70 will strip down to nothing, and is just pure faff-free. Aye, “progress” has often meant just adding features and crap onto rucksacks to give salespeople something to talk about!